This tape has been mentioned on the news pages already, with a note that "we hope to get it reviewed shortly". It arrived just before Christmas, so please forgive the delay, occasioned by the reviewer's need to recover from seasonal excesses. The music was recorded in the field by John Brearley, presumably recently, although no dates are given, and the tape retails for a very reasonable £5 from Trade plus Aid, 17 Paxton Close, Kew Road, RICHMOND, Surrey TW9 2AW; you can order by phone on 0181 948 0533 or 0181 287 3086. Trade plus Aid is a good cause, raising funding for food security, education and income generating projects in Africa and South America, which is one reason that I mention the "how to order" minutiae first; the other is that this is a very pleasant collection of music, which would certainly add to both the listening pleasure and the musical education of anyone with an interest in the sounds of Africa. The music of the different regions and peoples of Botswana is intimately connected to the natural world, and I don't say that in a drippy, new age sense; where there is wood, there are drums, where there are reeds there are flutes, and on the grasslands there is unaccompanied choral singing. Of these different musics, only the flutes ( dikathla , nowadays often made from metal tubing) are missing from the tape, which is a pity, for the ensembles of 13 or so single-pitch dikathla played in hocketing style seem, from descriptions, to make an exciting sound. The most common instrument is the mouthbow, parsimonious in its use of scarce resources, and easily portable by travellers and herdboys. The instrument is held to the mouth and tapped with a stick to produce a fundamental, and the shape of the player's mouth cavity is altered to produce the harmonics. Brearley's recordings do a good job of capturing this music, and in this example, (sound clip) - certainly does a much better job than Folkways managed when recording Sonny Terry playing blues on the jew's harp, which resulted in an LP (Folkways FJ 3821) on which most of the harmonics are inaudible. (I mention this because there seem to be clear affinities between African American jew's harp playing and the mouthbow, which crossed the Atlantic with the slave trade, to be played in the New World by musicians both black and white, and occasionally to be recorded.) 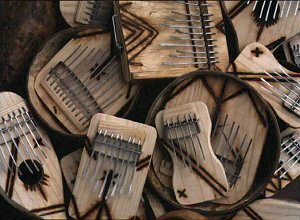 The segorogoro , featured on a couple of tracks, is an interesting variant of the mouthbow, in which the string is made to vibrate by using a stick to scrape the bow, which is notched, thus producing this combination of sounds, simultaneously earthy and eerie, and oddly reminiscent of Mongolian overtone singing. (sound clip). 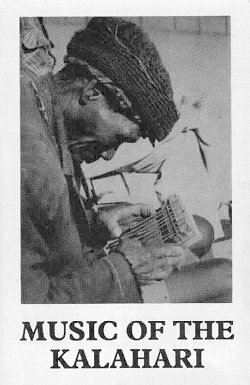 Other stringed instruments featured on the tape are the dakateri (foot bow), held against a resonator and tapped in polyrhythm by several people while another changes the note; the four string goroshi; and the single string segaba , aka segankuru , which is played with a very short cowhair bow. The segaba was formerly resonated by the mouth, but nowadays, as on this excerpt, (sound clip) a one-gallon paraffin can is usually employed as a resonator, and the instrument is leaned against the player's shoulder (see the fine picture in Grove Vol. 3, p. 89). Vocal music - which is usually virtually inseparable from dance - is often accompanied by percussion, which ranges from leg rattles and intricate clapping to drumming. The singing and dancing can be functional, with such objectives as healing or, as in this case from the north-east, to pray for rain (sound clip); but song and dance also serve to entertain, and/or to promote group solidarity. The children of Ghanzi Primary, here singing their school song, (sound clip) seem to have got away from the musical influence of the missionaries' hymnbook, which is more than the composer of my (Surrey) school song did. I could have wished for more extensive notes to accompany the cassette, but this tape is not aimed at an academic or specialist audience, and the notes that are supplied are a good guide to what is heard, which is delightful, well-recorded music, emerging from what seems to be a vibrant tradition - and retailing at a bargain price.